7/24 Cup of Coffee: The PawSox were held scoreless in a loss to Norfolk despite a three-hit day by Rafael Devers and a strong start by Brian Johnson. Led by Mike Olt (pictured), Michael Chavis, and Jeremy Barfield, the Portland bats exploded en route to a blowout win. Roniel Raudes and Stephen Nogosek struggled on the mound in Salem, though Jordan Betts and Jose Sermo clubbed two home runs each. Greenville received a strong start from Jhonathan Diaz but fell in a shutout loss. The PawSox lineup was unable to generate any offense to support a quality start by Brian Johnson. The lefty threw 6 1/3 innings, allowing three runs on seven hits and a walk while striking out five. Noe Ramirez and Robby Scott provided scoreless relief. Third baseman Rafael Devers was the standout for Pawtucket's bats, going 3 for 4. The Sea Dogs lineup broke out on Sunday afternoon with an eight-run fifth inning as part of a 13-run performance. First baseman Mike Olt had a huge game, going 3 for 4 with a home run, a triple, a walk, three runs, and three RBI. Michael Chavis was 2 for 5 with two doubles, a run, and an RBI. Designated hitter Jeremy Barfield was 2 for 5 with a two-run homer in the fifth inning. Dedgar Jimenez made a solid start for Portland, allowing one run in five innings though he did walk five. The Red Sox knocked 15 hits and scored ten runs on Sunday afternoon but it wasn't enough. Jordan Betts was 2 for 4 with two home runs, three RBI, and two walks. Jose Sermo went 2 for 6 with two homers and three runs scored. 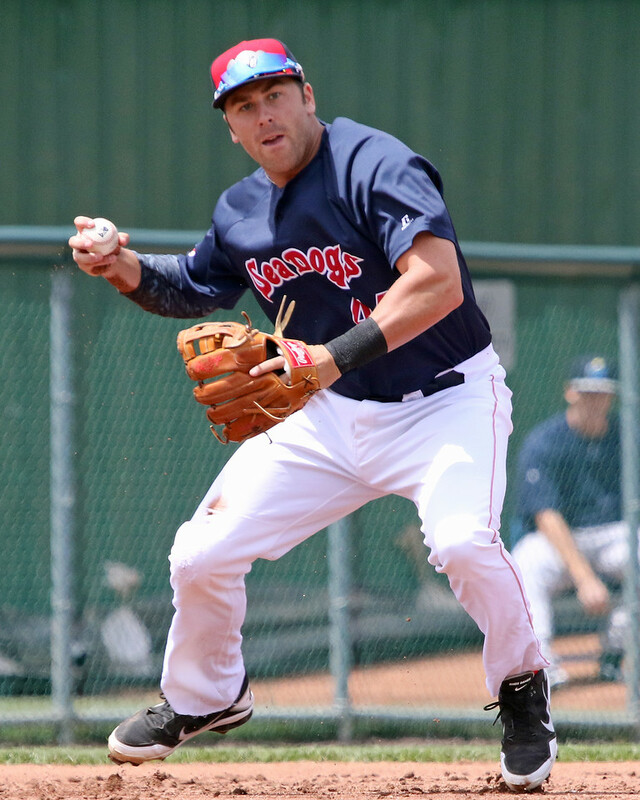 Second baseman Nick Lovullo went 3 for 4 with a triple, run, and RBI. Roniel Raudes has been on a run of good starts but he struggled on Sunday, allowing four runs in five innings to raise his ERA to 4.32 this season. Daniel McGrath pitched well in relief, allowing just an unearned run in three innings. 25th-ranked prospect Stephen Nogosek struggled mightily, taking the loss after giving up six runs in 2 1/3 innings. Jhonathan Diaz made a solid start for Greenville, going five innings and allowing two runs on three hits and two walks, but he was tagged with the loss. Pat Goetze threw three innings of relief, allowing one unearned run on four hits. The lineup collected only four hits and first baseman Tucker Tubbs had two of them, going 2 for 3 with one strikeout. Starting pitcher Nick Duron went five innings on Sunday, allowing three runs on three hits while striking out and walking three. Mitchell Osnowitz gave up one run in three innings of relief, fanning three and walking three. Lowell's only run came on a sacrifice fly by Michael Osinski, scoring Yoan Aybar. Catcher Samuel Miranda was 2 for 4. Player of the Day: Mike Olt played a key role in a blowout win for Portland, going 3 for 4 with a home run, a triple, a walk, three runs, and three RBI. The 28-year old Olt is now hitting .260/.346/.481 this season since signing a minor league contract with the Red Sox in February. Olt was taken in the first round by the Rangers in 2010 and was ranked as one of the top 100 prospects in baseball before the 2012 and 2013 seasons.